For a run down on the points situation and the points available, check out our Essential Guide. Wow... This is going to be one insane race! The difference between Minnaar and Gwin is nothing.... Gome on Gregg!!! Apparently Minnaar had a huge crash in training and he's lucky to be even riding. So his time is even more amazing! GO GREG!!! YOU CAN DO IT! AND TROY! It's a friggin' incredible stack of riders this year. Also... CECILE GETTING 9th!? First ever world cup dh. Jesus. This race will be epic! The Goat for the win! @bikekrieg: she's 25 seconds back. Wonder if she will be able to pull in more time, or will lose more for her race run. You're all forgetting about Danny! He was on pace in the first split but then he lost his chain, got a double puncture AND his brakes failed but he still managed an 8th place!!! COME ON DANNY! YOU CAN DO THIS! I'm as giddy as a little school girl, it's going to be tight! @scott-townes: No, he can't. He can take 1st place and all the others above him DNF, and he'll still be in 4th. I do hope he takes the win if Greg doesn't! @cptmayhem: I think he just means the race results not the series. @scott-townes: and his wife left him? I can't pick - I hope it is a 4 way tie. @scott-townes: Jeez....hang on to your bike Danny! @squarewheel: Thats a crazy break! Anyone have video? @squarewheel: It is Santa Cruz's new Impact Absorbing Carbon Layup that sacrifices the frame so the rider can still go on and qualify 2nd for World Cup races. Like MIPS but for frames. @scott-townes: Is that true??? Source? Also, its great to see more than just one American flag in the top spots! @squarewheel: Well well,well what hammer broke the frame ?Must be Thor because in lab a regular hammer dont do anything to the frame as we see in promo videos.The God Thor dont like Spec ? Just a heads up to say Ben Cathro is out in VDS and putting out some killer vids as usual. Also a great channel BTW. @scott-townes: I heard he had a saddle sore and someone stole his breakfast too. @enej46: yeah, he broke his bike in half, and was still able to qualify 2nd on a back up bike. @enej46: Broke his bike in half. The ragged edge is getting a pounding this weekend. All of this is already hard to process and we haven't even started yet! Allez les frogs! I hope everyone is using this showdown to troll people on FB in making them think you are talking about mayweather vs mcgregor. @WAKIdesigns: completely agree, that was a fracture from before this event. also proves how good carbon is at hiding iminant failure. looks like he was literally riding a normal part of the track too. imagine if it happened on a huge landing or really pinning it. got lucky for sure. @squarewheel: After they cover up the two pieces of frame with a jacket it becomes a 29" DH bike with the world's shortest wheelbase! Is this how we'll reverse the "longer-slacker" trend? Minnaar is riding big wheels with the new Santa Cruz V2 frame: "tracks like this really favour a shorter-steeper setup, so I'm riding 32" wheels and a new frame sporting a 500mm wheelbase." @Sweatypants: HOLY CRAP. Looks like his wheel caught a bit of a hole and wanted to exit stage left. On second viewing, front wheel lost traction and slipped right on that little rock at the bottom of the hill / g out section. Front grabbed super fast again and ejected him stage left. Nothing he could do. It was the frame impacting on the post side on that did the damage, the frame was in one piece until that point. @rockyflowtbay: GWIN!!!!!!!!! Got it??? GWIN!!! @metaam: just like with moon landing or with Kennedy's assasination(s), we will never know even if Greg said his wheel just tucked out of his mistake and there was no way it was the breaking frame that caused the crash - People would speculate simply because the obvious answer is not the attractive one. I mean look at that mess with Sagan and Cavendish... there are people who still believe he elbowed him. Are we watching the same vid? Are you seeing the same thing I see?! Obviously not... one of us is dumber. Off course the fricking pole broke that frame. The layup is tailored to take foreaft forces and is shatter proofed from underside, not designed for side hits. And his frame is wrapping on that pole sideways. A dude landed with his ff helmet on my friends remedy 9.9 lying by the side of the trail. Top tube snapped. And someone thinks this won't happen while his bike is flying at high speed? 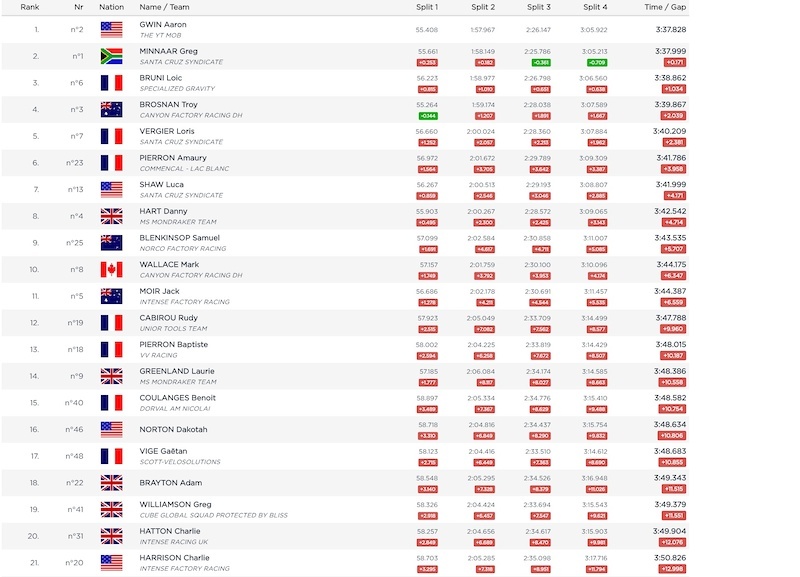 @bikekrieg: This is just qualifiers so doesn't really count, but weren't there only 18 women competitors? 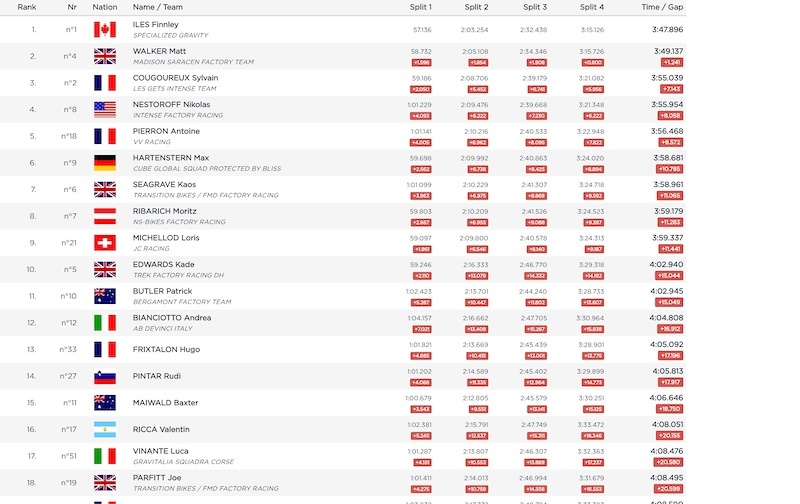 So she is at the middle of all the competitors at 9th, but the real kicker is she was +25sec off of 1st, sorry but that's not that impressive, if there were 100 competitors then I would say WOW. Now Sam Hill moving from DH to Enduro and 1st race taking 10th out of 112 that's impressing. However, these are just qualifiers, lets see how she does in the race! @WAKIdesigns: Reading that was like watching a snake eat itself tail first. Finn's time would've placed him in 13th elite mens...good job kid. Yeah. He's going to transition to elite really well. So is Walker. Koas will do pretty well in a couple years. Gwin beats Minnaar - Gwin wins. Minnaar beats Gwin - Minnaar wins. Last 2 men down the hill. Epic. Only if they finish 1-2. If they are outside the top 2, things will get interesting in the overall. 200 pts for first, 160 pts for second, 125 for third, 110 for fourth... 23 points separate them presently... I am hoping Troy puts down a sick run and puts pressure on the top 2! It's Val di Sole, lots of rocks and roots. Gwin often destroys a wheel when he pushes hard. Greg no so much. Just saying! Yes, this is going to be insane. Cannot wait. But I swear to heaven if Gwin has a mechanical at the bottom again...Oh boy. @joe-falconi: haha Greg just snapped a frame in two! Since Gwin qualified 1st he also gets 50pts for that. @RatHunter83: how many points did Greg get? 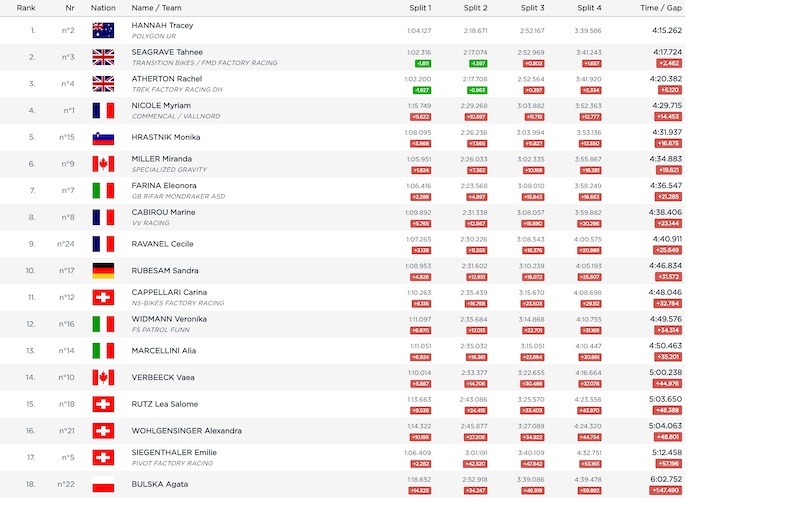 @stylishskier: so you guys are wrong if everything you said is true..
hmm, 9th for Cécile, not bad for a first one in DH WC. I hope to see her in the top 10 tomorrow. I bet she's got more on tap as well. I wouldn't be surprised to see her in the top 5. "9th" sounds a lot better than "25 seconds off the leader's pace", which is the reality she has to grapple with. First World Cup and a Top 10 would be a super achievement (remember Gwin?) but to think that she would do any better at her first World Cup, on this track of all tracks, is just not very likely. @ka-brap: I'm not that impressed, there were only 18 women competitors in total. Top 10 achievement means a lot more when there are 100+ competitors like there are in the men's roster. Damn! Back to the 90's! That is a scary looking failure. Did the bike collapse underneath him and send him cartwheeling? 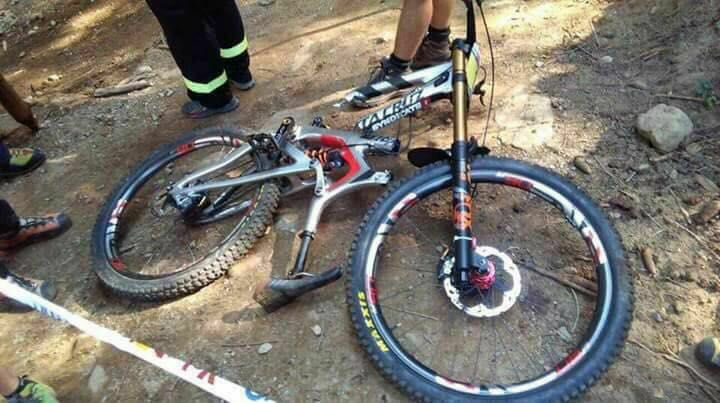 "minnaar crashed sending the bike flipping and wrapping it around a tree/post causing it to break. it didn't break while he was riding. he qualified in 2nd place (only .177 seconds back) just an hour later on a freshly-built bike. he's clearly not worried about the strength of the bike. i guess there will be footage of the incident soon.﻿"
MInnaar must be pissed off. If he would take the qualifying win today he can be a 2nd in a race day and grab the overall by 3 points. Cheering for Greg! @AdamOdh: Ha! To lose out by such a minuscule margin! Thats racing. Let's not forget that we have a battle on the womens side too with both Tracey and Tahnee gaining valuable points today. Pink Bike fashionista's may have to fall on their swords lol, cause Tracey is killin it on the R3ACT Polygon prototype. @TPLRacing: Put Gwin on a toaster and he'll be in the top 3 overall. Tracey's result is not exactly hard science. The French are killing it (in mens)! 4 Americans in the top 21 ... this a huge step forward from years past. This is rad to see. ...and not one freakin German...embarrassing!! Yes they are! I wonder what it is. But yeah, the French seem to have incredible riders, in all disciplines. Is it something in the water over there!?? I mean, I don't think anyone would be sad. Troy is probably the friendliest dude on the circuit. Hard not to like the little bloke! I think Troy has had a great season with the new team. The beginning of the season he looked a little hesitant but has really turned it around now. Can't wait to see what he can do next year. @RatHunter83: why are you talking about next year when he's on the contention for the overall title as we speak? Oh yes!!! Would be awesome to have a Canadian at the top of the game again! It was so much fun cheering for Smith, I miss that! @t1000: Don't forget about Mark Wallace. Currently ranked 8th!! @dhpig: Absolutely! I was blown away by Wallace last year when I went to Mont-Sainte-Anne WC. His line in the rock garden was unreal! He deserves top support from the fans! But I doubt he will ever reach Smith's level. I'd love him to prove me wrong though. Smith seriously steped up his game around 23-24yo. The year he won many WC, and the overall if I remember well. Maybe Wallace can do the same! If Gwinn wins, he takes the overall, even if minnaar is second ! Yea Mark Wallace! Git Sum buddy! Women's race is going to be a nail biter. Myriam Nicole was 15 seconds back with a full off-the-bike crash so it's certainly not in the bag for Tracy. I hope the commentators have their spread sheets set up to give us results as they come in otherwise there will be a lot of guessing and confusion. nice one Dak Norton! Killing it! Seriously, what a sick result! Let's hope he can bring a solid run in the finals! Agreed! Dakotah is shredding right now, love seeing him kill it. Go Dakotah! Luca doing well too. Best last race in DH history... women's and mens. All 3 with a chance to win are all in the top 4. With the men the only 3 guys with a chance to win all had green splits. Tracey's Polygon is totally fugly - fast and ugly! These guys are bringing epic to a whole new level ! Minaar doesn't have to beat Gwin to get the overall. He can finish one position behind Gwin and still have enough points cushion to win the overall as long as Gwin doesn't win. If Gwin get's 2nd... Greg only needs 3rd. Gwin Gets 3rd... Greg only needs 4th.. etc... If Gwin wins... Greg is screwed. If I were Greg - i would share all my secrets with Brosnan, Moir, Hart etc.. . A win for anyone but Gwin would make the overall title easier for Minaar. Cecil in the top 10! Apparently minnaar snapped his frame! For some reason I think that Gwin will have a better chance at world champs if he loses the overall this year. And seeing Minnarr win the overall would be epic. But seriously, where is that track walk article? Minnars bike from practice??!!!??!! How the hell did he manage to walk away from that?? Watching this ultimate show down in the morn and then going to a soft opener to our freshly built local bike park in the afternoon. Cannot wait! any one see the pics of the V10 in two halves??? Glad it wasn't Greg's quali run RACE IS ON!!! Is there going to be a 'Predict Top 3' competition for this race?? What happened to Pompon?!? Also, anyone know what happened to Payet? He's usually better than 44th. @ryanlaf12: Correcting you without verifying, but she lost 10 sec in the first split. Pretty sure that means she washed out on the first turns. So she should be on pace come race time. Doubt she let off the gas as her lead was not huge. @alfarac: That's what I kind of thought might have happened. Thanks for that! No sick mick? Just getting ready for worlds? Mr Minn for the win! how hard would it be to have the full results published or at the very least a link to the fully qualifying results? @fraktiv: Thanks for adding them. I admit that I liked the old way with Scribd inline in the page. Always worked great for me! Only an extra couple of clicks now but such is the plight of our people. The usual suspects are all there! This race & season is definitely one we'll talk about for a long time! Wow! lets GO GO GO GM !!!!!!! Dang! So close! Whats the points difference after the Quali..? Greg !! Go you good thing !! Top 21 men tighter than the top 4 women. Wow. Hart is going to smoke everyone. Minnaaaaaaar all the way! This track fits Minnaar's style very well. No fantasy contest for VDS? Tracey Hannah rank one on awesome proto bike, get rekt haters. Hannah seems to like the new prototype with react..
what happened to greg's bike? I heard huge off & lucky just to be on bike today let alone quali second. Does anyhow know what happened to Minnaar? There is a picture where the frame is broken in half, specialized style. Gwinn for the Win !!! Holy ballz Cecile killing it! I'm so torn one side of me is a Patriot and the other wants to see the GOAT get this. Not that I want it to happen... but the Eagle will lose its air again, unless he is on blacked out cortos. The only person from the Syndicate running 27.5 is Loris so far it seems. So he was probably on 29. I've love to see Danny win it and gwin not take the title. Just saying..
"I'd love to see Danny win it and Minnaar, or Brosnan take the overall"
Whatever happened to "if you can't say anything nice don't say anything at all"? It's going to rain and Gwin can't ride in the rain. Anyone got any pics of XC training?